The Obama administration purportedly wants to use the lever of transportation policy to reduce greenhouse gas emissions, and Transportation Secretary Anthony Foxx recently said he’d like to reverse the damage highways caused in urban neighborhoods, but you’d never know that by looking at U.S. DOT’s latest policy prescription. U.S. DOT has drafted new rules requiring state DOTs to track their performance. Reformers hoped the rules would get states to reconsider highway expansion as a method of dealing with congestion and emissions, since widening roads induces more traffic and pollution. By introducing better metrics and reporting requirements, the thinking goes, U.S. DOT could compel states to document the failure of highway expansion, which would lead to pressure for a new approach. But the rules released yesterday are a big disappointment, say analysts. While it will take a bit more time to fully assess the 423-page document [PDF], advocates are already going on the record panning U.S. DOT’s effort. There’s nothing with any teeth here. Instead — in a 425 page proposed rule — there are just six pages (p. 101-106) addressing greenhouse gas emissions that read like a bad book report and a “dog-ate-my-homework” excuse for doing nothing now. Instead, DOT offers up a broad set of questions asking others for advice on how they might do something, in some future rulemaking, to address climate change. This is hugely disappointing, considering that anonymous Obama administration officials were bragging about the impact of these reporting requirements to Politico earlier this week. At the rate things are going, half of Florida will be under water before American transportation officials acknowledge that spending billions to build enormous highways serving suburban sprawl is broiling the planet. There was also some hope that U.S. DOT would reform the way congestion is measured. Current measures of congestion emphasize vehicle delay, which leads to policies that actually promote more driving and more total time spent in cars, as agencies seek to temporarily reduce delay by widening roads. Policies that reduce traffic by improving transit or enabling people to live closer to work don’t rate well under this measure of congestion. The core measure of whether a metropolitan area is making progress in addressing its congestion problem is what USDOT calls “annual hours of excessive delay per capita.” This congestion measure essentially sets a baseline of 35 mph for freeways and 15 mph for other roads. If cars are measured to be traveling more slowly than these speeds, the additional travel time is counted as delay. The measure calls for all delay hours to be summed and then divided by the number of persons living in the urbanized portion of a metropolitan area. When you get down to it, U.S. DOT’s congestion metric belongs to the same line of thinking that led Houston to spend $2.8 billion widening the Katy Freeway to 23 lanes only to see traffic congestion return with a vengeance a few years later. 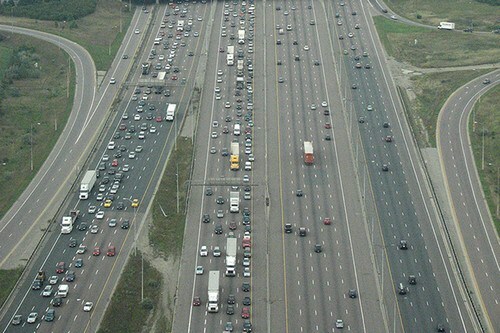 Instead of managing demand for freeways, it will lead to more supply. California has shifted away from an emphasis on vehicle delay and instead uses “Vehicle Miles Traveled” as a performance measure. VMT measures how much traffic a given project will add to streets and highways. U.S. DOT is nowhere close to such an enlightened position. Caron Whitaker of the League of American Bicyclists also notes another big disappointment. Now for the good news. This process isn’t over yet. The rule can be amended — and anyone can weigh in. The comment period will open Friday and will likely be open through the summer. U.S. DOT needs to be inundated with comments that call for a modern approach to measuring transportation system performance. This is a down payment on the administration’s 21st Century Clean Transportation Plan, a budget proposal to reduce traffic and carbon intensity of the transportation sector. Let’s hold them to that. Correction: The article originally showed a picture of Houston’s I-610, not the Katy Freeway. On carbon pollution, there is nothing that prevents DOT from addressing that urgent and important issue effectively in this rulemaking. And that’s exactly what President Obama and Secretary Foxx should do! How about we take into consideration pedestrian and cyclist delay? I’ll propose a metric which counts as delay any instance where pedestrians can’t average at least 3 mph and strong cyclists (or people on e-bikes) can’t average at least 20 mph. We all know the traffic controls designed to speed cars along seriously effect travel times of other modes. When that delay is taken into account we may be forced to remove such controls. That in turn implies we’ll need to reduce motor traffic volumes to levels which are safe without traffic controls. Or instead we’ll be forced to build pedestrian and bike infrastructure which gets around the delays imposed by traffic controls. Either outcome is fine with me. No elected official will ever have what it takes to confront automobile culture top-down. It’s more hopeful to do what ever can be done to make driving expensive. What is it now, $15,000 per year? I’ve been saying this for years, ever since I discovered in my intro to Traffic Engineering course that signal timing gives zero consideration to pedestrian delay (much less cyclists). Mathematically, even in the best case you can’t time signals to accommodate more than a small subset of pedestrians or cyclists. In many cases you can’t at all. That still doesn’t negate the fact these signals cause massive delays to both pedestrians and cyclists. Unfortunately, it seems the traffic engineering profession just brushes this aside. Often the answer is “if you’re in such a hurry then you would be driving, not walking or biking”. Nevertheless, it’s high time we acknowledged the problem as a first step towards doing something about it. If we can’t remove traffic signals then we need to put accommodations in place for pedestrians and cyclists to bypass them. That’s especially true in places which have large numbers of traffic signals like NYC. This takes hyperbole to the stratosphere. Consider how much GHG will be emitted from new US highway expansion, and divide that by the total global emissions. What is that number, say 0.1% ? So yes, when Florida is flooded we will attribute 0.1% of the seal level rise to new road construction. And while we are making this comparison, we must consider the offset, which is how much additional GHG emission will there be if the roads are NOT expanded, presumably by cars idling in traffic? More to the point, DOT makes *transportation* policy. Not environmental policy. This article is misleading and factually incorrect. The document in question is a notice of proposed rulemaking. It isn’t even going to be formally published in the Federal Register until tomorrow. It’s a work in progress that’s opening for public comment, and it’s anything but final. If you want to inspire action, fine, but be intellectually honest about it. There’s also the little matter that the photo used is not the Katy Freeway. Not that I expect a lot of people to know that, but if people are zeroing in on the minor errors in her piece (like I just did), her bigger message is being lost. What part of “This process isn’t over yet. The rule can be amended — and anyone can weigh in.” did you not understand? That’s why it’s intellectually dishonest. Everything in the first half indicates it’s a fait accompli: “DOT Blows Chance,” “the rules released yesterday,” “there was also some hope”… These are misleading bordering on false, and worse, the author knows it, saving the revelation that it’s still a work in progress at the end. Again, if you want to inspire action, fine. But be honest about it. Nothing dishonest about it. DOT could have drafted far better policy. The proposed rules are an enormous disappointment and DOT completely blew its chance to get this right from the outset. Fixing this is going to take tremendous effort. Since pedestrians dominate in number over all over road users in any active commerical downtown area (but especially NYC), the signals in those areas should be timed to accomodate all pedestrians first. It’s quite easy to do this. Just give pedestrians the right of way *all the time*. Cars can go when there’s a break in the pedestrian traffic, perhaps at midnight. Easy peasy. In NYC in particular, you only drive a car if you’re *not* in a hurry. It’s the slowest way to get anywhere and you can generally go faster on foot. If you’re really in a hurry you take the subway. I’ve already said we should do this—namely give pedestrians and cyclists right of way over automobiles all the time in urban areas, regardless of the signal state. It will force drivers to be on their toes at every intersection. Like you said, nobody with half a brain drives in NYC if they’re in a hurry anyway. I followed the link, and on that website it is also labeled as the Katy Freeway. What is your evidence that it is not the Katy Fwy? Because I’ve been on the section of I-610 in question. That and the guide signage over the mainline was showing the exits to I-10. I-10 is the Katy Freeway. It appears that they have since update the photo. Yeah we corrected. Thanks for pointing that out. All the more reason to back efforts that focus on reducing emissions like fine- and ultra-fine particulates, ozone-forming pollutants (like nitrogen oxides, volatile organic compounds, etc. ), which have been identified as contributors to debilitating diseases such as asthma and other respiratory and cardiovascular and worse diseases like lung cancer which can lead to death. This should be the primary focus. So what part of all of this and other pollution is coming from transportation and from cars and trucks in particular? This needs to determined if it hasn’t already. If it can be proven that such pollution is on the rise because of lower fuel prices, more people buying more vehicles that produce greater amounts of pollution due to such vehicles being less fuel efficient, then quite possibly there could be a compelling case to do a 180-degree turn. What also needs to be determined is the associated healthcare costs. If those are on the rise, then once again a case can be made for instituting measures to better control and mitigate the aspect connected with the emissions sources. If the numbers of people prematurely dying and becoming ill on account of the transportation-contributed emissions, then, I’d say (as the saying goes): Houston, we (really do) have a problem! The ability to tabulate LOS for bicyclists and pedestrians already exists, it just is rarely used. As such, everyone needs to demand that their local, regional, and state transportation agencies start using and applying the metrics for all modes.